Maryland is on the verge of becoming the second state, after Connecticut, to heed President Barack Obama’s call for a new national minimum wage of $10.10 an hour. Lawmakers moved in a special weekend session to pass a measure hiking the state’s minimum to $10.10 an hour, up sharply from the current minimum of $7.25. The Maryland Senate passed the bill on April 5, and the House of Delegates gave its approval around midday on April 7, just hours before the year’s legislative session ended. Gov. Martin O’Malley (D) is expected to sign the bill into law promptly. In January, he called the wage hike his top legislative priority for the year. The victory for low-wage workers, however, has left some progressive groups frustrated and a little angry. The reason? They say the most potent attempts to kill, dilute or delay the bill came from Democratic Party legislators who publicly proclaim their support for the working poor, yet worked behind the scenes to undermine the new minimum wage law. Democrats enjoy large majorities in both houses of the legislature. “Maryland is a Democratic state, but not necessarily a progressive one,” says Pat Lippold, political director for hospital workers union 1199SEIU, a division of the Service Employees International Union, which helped push for the bill. “We didn’t expect any support from the Republicans—and we didn’t get any. But every effort to weaken [the original wage proposal] came from Democrats. Our work became beating back Democrats,” says Charly Carter, Executive Director of Maryland Working Families, an arm of the New York-based Working Families Organization. Working Families started a coalition two years ago called Raise Maryland to advocate for the minimum wage boost. Labor unions such as 1199SEIU, American Federation of State, County and Municipal Employees (AFSCME) and United Food & Commercial Workers (UFCW) Local 400 form the backbone of the coalition, along with units of the NAACP and citizen advocacy groups such as Casa de Maryland, Progressive Maryland and the National Employment Law Project. The coalition ultimately attracted about 60 groups including faith-based organizations and even Democratic Party youth groups. Any lingering anger at conservative Democrats is due to the fact that they were partly successful in watering down the law, although some of the worst suggestions were ultimately rejected. The original proposal, for example, called for the minimum wage to be raised in several steps until it reached $10.10 in 2016. But amendments proposed and supported by Democrats stretched out the phase-in an additional two years, to July 1, 2018. Worse, Democrats killed the part of the original bill that would provide annual cost-of-living adjustments to the future minimum wage, a key element in preventing the erosion of earning power by low-income workers. And that’s not all. Raise Maryland was keen to include raises for tipped workers, who are currently only required to be paid $3.63 an hour under state law. (Critics have pointed out that the law assumes that tips will make up the rest, but that is not always true in practice.) The House of Delegates declined to do so and froze the tipped wage at the current level for the next four years. The legislators explicitly rejected a more progressive measure, advocated by Gov. O’Malley, to set the tipped wage at 70 percent of the state minimum, which would have allowed the two to rise together. Adding insult to injury, the Maryland legislators also engaged in a public spectacle of special pleading for amusement park owners, Carter and Lippold both relate. Known as the “Six Flags Amendment,” the provision put forward by Democrats would have exempted the owners of the Six Flags America amusement park in Upper Marlboro, Md., from the new minimum wage law. When the exemption gained quick support in the legislature, other amusements operators jumped on the bandwagon and convinced legislators on both sides of the aisle to load up the bill with additional exemptions, Carter says. House of Delegates Speaker Michael Busch (D), who is counted a strong supporter of a more progressive law, was ultimately forced to intervene behind the scenes and put a stop to the amendments, she says. Even so, the final legislation allows Six Flags its own minimum wage, set at 85 percent of the statewide figure. “What’s amazing is that when you poll the public on the minimum wage, the [pro-increase] numbers are just off the charts,” Lippold adds. “So there is almost no downside,” for legislators to support a higher minimum, she says. “But the devil is in the details,” and skilled lobbyists for restaurant interests and the Maryland Chamber of Commerce are able to exert outsized influence, Lippold says. The experience of lobbying to raise the minimum wage has solidified the commitment of the Working Families Organization to establish a permanent base in the state and to become more involved in electoral campaigns, particularly at the Democratic Party primary level, Carter says. “Some of these so-called ‘moderate’ Democrats need to be challenged and held accountable,” she says. Formal announcement of the new Maryland unit should be forthcoming within a month, she tells Working In These Times. The Raise Maryland coalition will also remain intact and look for other ways to advance pro-worker legislation, especially a new effort to guarantee paid sick days to all workers in the state, she says. Nearly a half million Maryland workers are expected to benefit from the minimum wage increase, with the first raise, to $8.00 an hour, scheduled for Jan. 1, 2015. 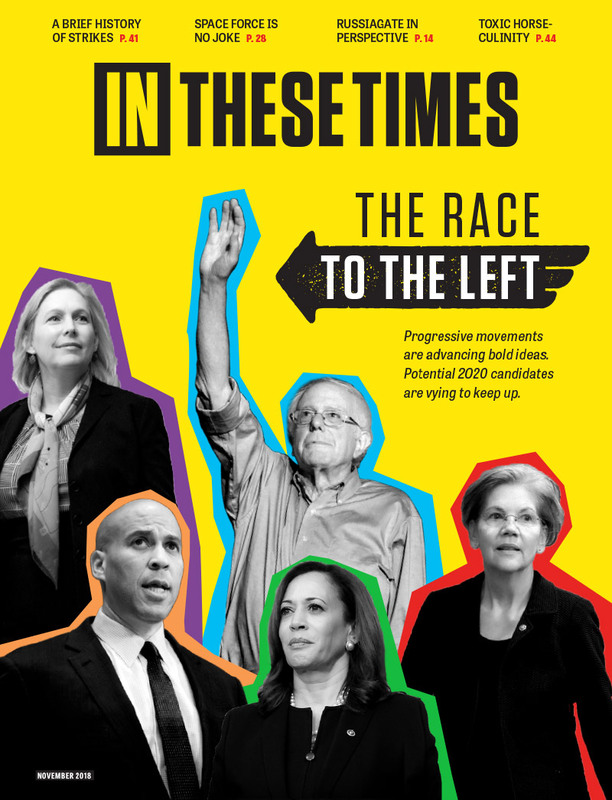 Full discosure: AFSCME is a sponsor of In These Times. Sponsors have no role in editorial content. Please remind people that Obama and Maryland lead in the push for Trans Pacific Trade Pact (TPP) that will make all labor and justice laws mute. It will not matter if we have a minimum wage law if TPP will allow global corporations to come to the US and work under their own nations' labor laws. So this is progressive window-dressing by two global corporate pols...Obama and O'Malley. Secondly, when you use the terms prestigious and Hopkins in the same sentence....when Hopkins is known in Baltimore as the most neo-conservative, corrupt, and the source of capture of all that is public in the city.....the source of impoverishment and autocracy in what is known as a company town...I'm wondering who edits your articles. This is a joke, right? It doesn't get to $10.10 for 4 years, goes up minimally next year. And to allow special interest like amusement park is insulting to all other businesses in the state. There are Dems and then there are true Democrats, those who aren't corporate Democrats, but are for the people.